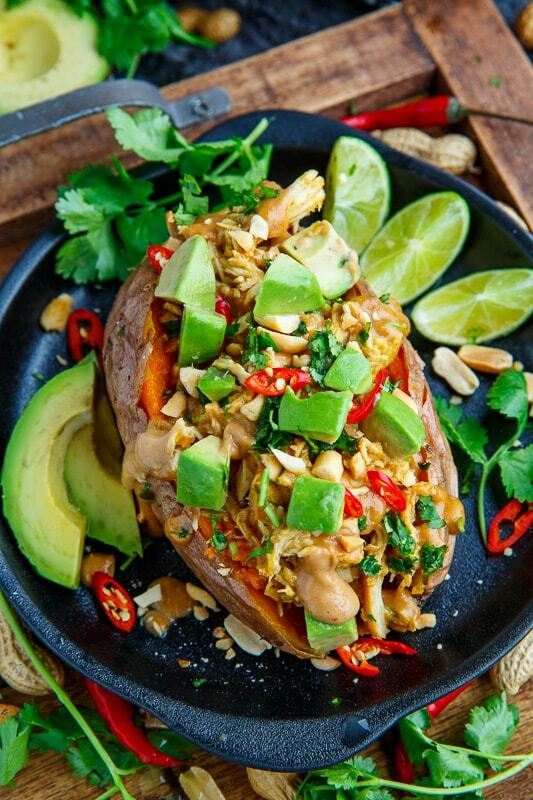 Tender roasted sweet potatoes stuffed with spicy peanut sauce drenched slow cooker chicken that is so easy to make and so tasty! 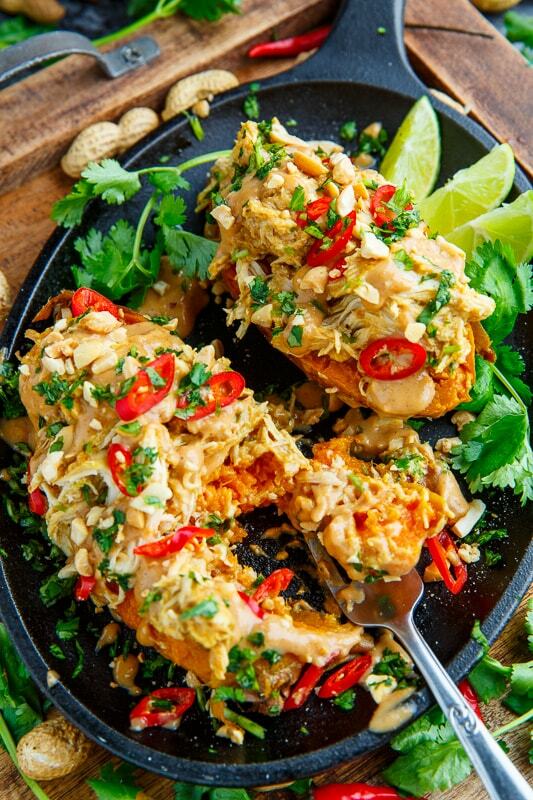 I have been such a huge fan of spicy Thai style peanut sauce ever since I first came across it and these slow cooker peanut chicken sweet potato boats are a great way to enjoy it! The peanut sauce is a nice balance of spicy, sweet, salty, and sour all on the base peanut butter flavour! Yum! 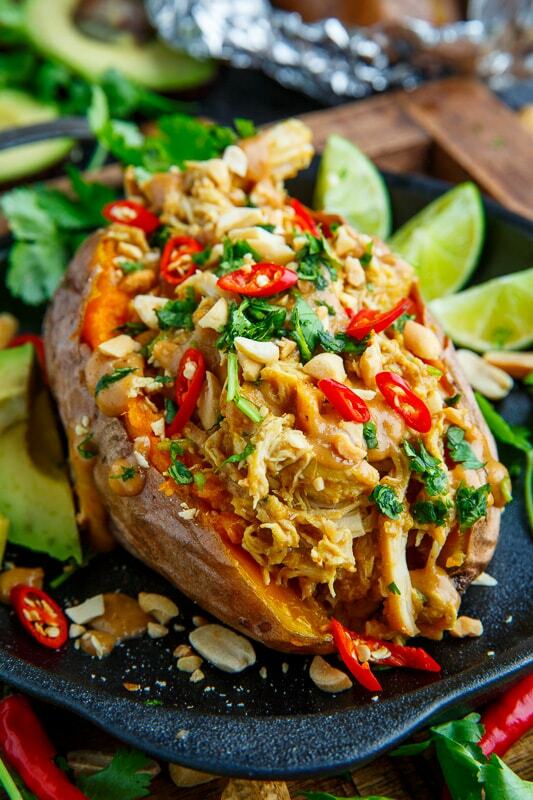 This recipe could not be easier, you simply slow cook some chicken in peanut sauce and shred it before stuffing it into some roasted sweet potatoes. 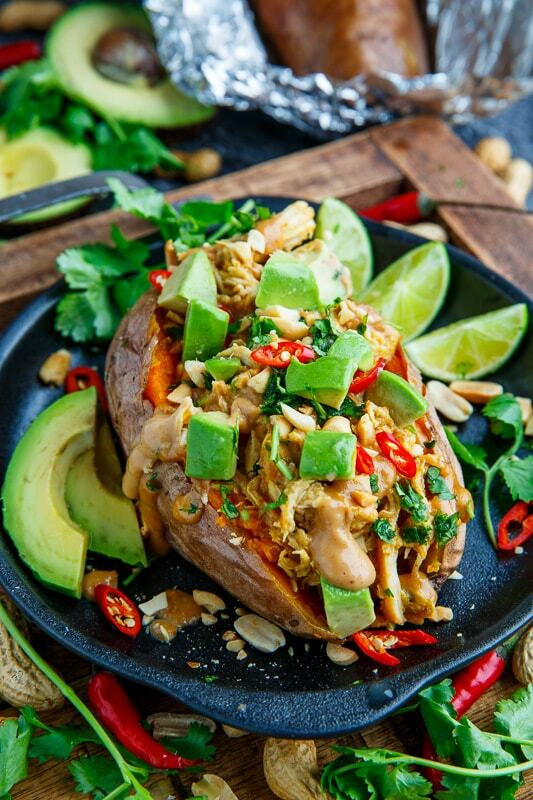 The combination of the spicy peanut sauce with the sweet potatoes is absolutely amazing! 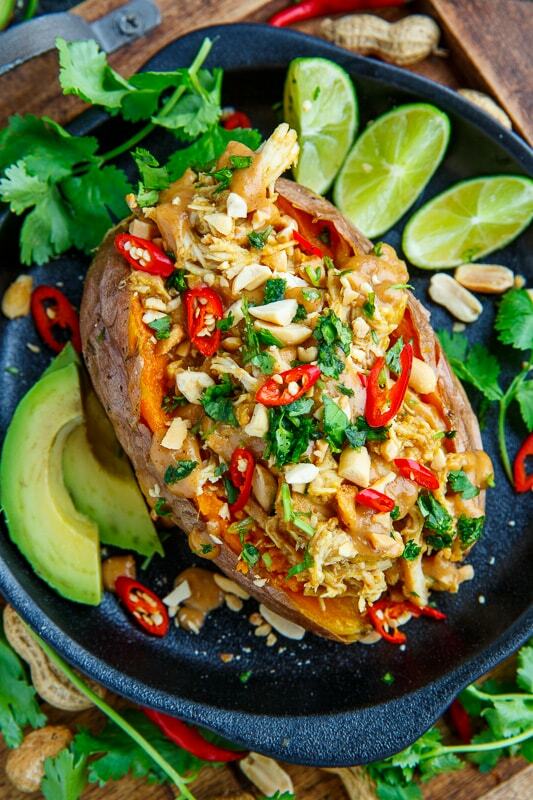 Garnish with some crunchy peanuts, fresh avocado and chopped cilantro for one really amazing meal! 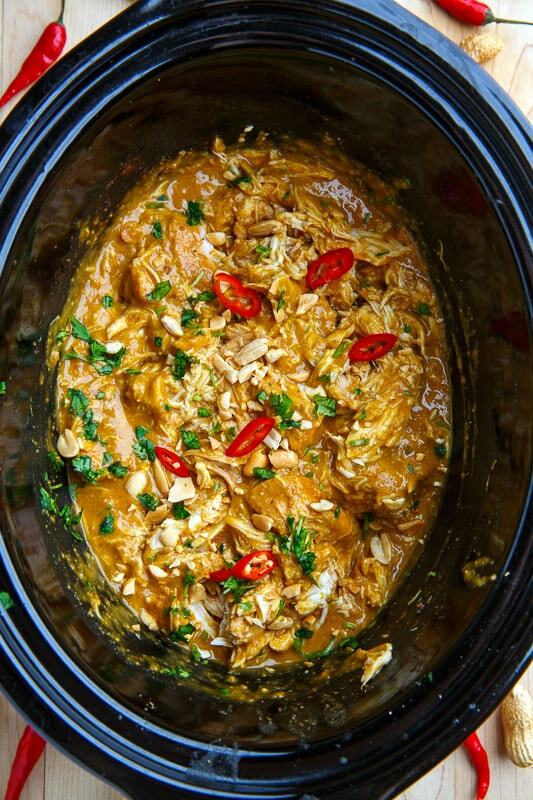 Place the chicken and peanut sauce in the slow cooker and cook on low for 6-10 hours or high for 3-5 hours, before shredding the chicken and mixing it into the sauce. Meanwhile about an hour before the slow cooker is done, poke the sweet potatoes a few times with a fork, wrap in foil and roast in a preheated 400F/200C oven until tender, about 45 minutes. 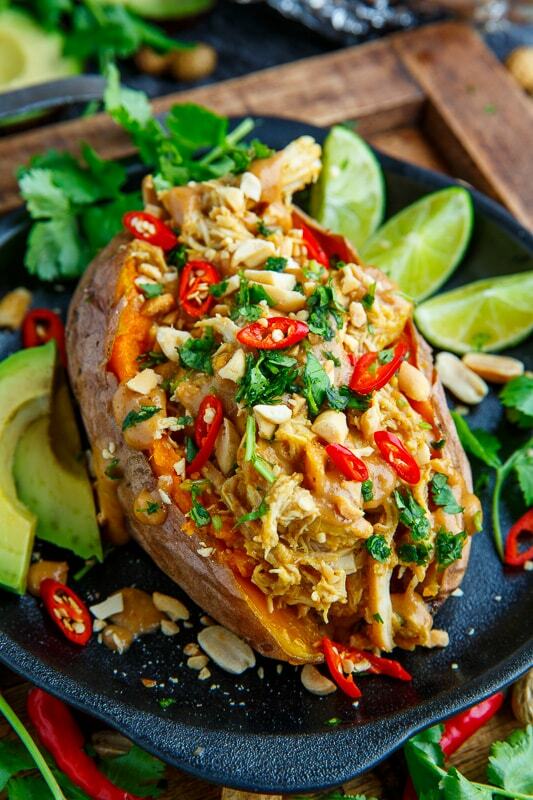 Split the sweet potatoes open and stuff with the shredded peanut chicken and avocado before sprinkling on the peanuts, cilantro and lime juice. Option: Poach the chicken or use roast chicken for a quicker meal! Option: Serve with fresh cucumber slices! 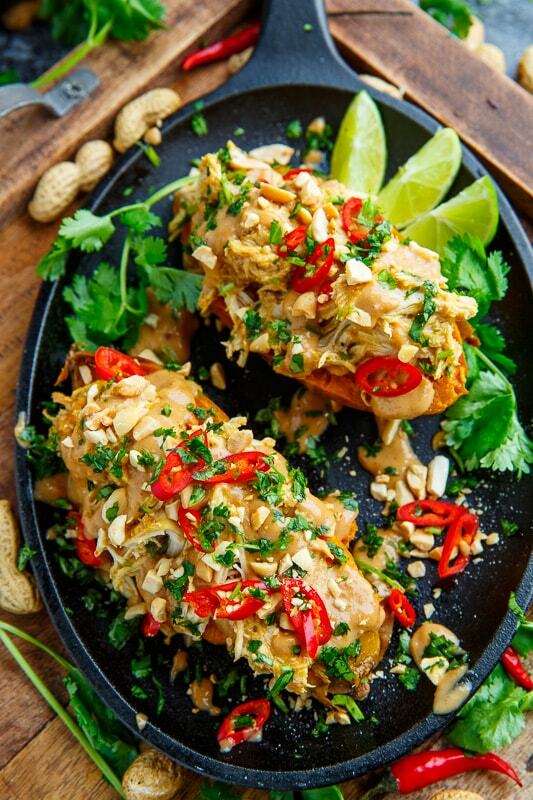 Note: If you are using a store-bought peanut sauce you may want to season with 1 tablespoon, each, of fish sauce (or soy sauce), lime juice, palm sugar (or brown sugar), and sriracha (or other chili sauce). What kind of red pepper did you use for the dish in the photo? It's not mentioned in the recipe. I think he used a bird’s eye chilies. Yes, the chilies are birds eye chilies! I saw chilies on top of the sweet potato. I think that would be a good combination sweet, savory and spicy in a single meal will surely be heaven! I love the taste of peanut sauce in dishes so will definitely try this one. Thank you!